The recent launch of Mitsubishi’s HCCV1001 underlines the efforts undertaken by rotary scroll air compressor market giants to be placed a notch higher than their contemporaries. Elaborating further, Mitsubishi Heavy Industries launched a commercial refrigeration condensing unit – the HCCV1001 by using a carbon-dioxide refrigerant. The new product is expected to employ a two-stage GSR compressor that combines both the scroll compressor and rotary compressor mechanisms. While the latter provides benefits at low-pressure ratios and is operated during the first stage of compression process, the scroll compressor is implemented in the second phase of compression for the high-pressure ratios. Mitsubishi’s product launch is an instance testifying the fact that rotary scroll air compressor technology is rather beneficial and cost-effective as compared to other compressor technologies. Strongly characterized by innovations, rotary scroll air compressor industry stands to gain massive gains in the ensuing years, driven by beneficial product features such as high performance, reliability, and energy efficiency. The mounting demand for contamination-free and consistently compressed air in production processes across the food & beverages sector is likely to augment rotary scroll air compressor industry expansion in the years ahead. As per research, food & beverages applications contributed more than USD 200 million towards rotary scroll air compressor market in 2016. Another lucrative application arena is the medical sector. It has been predicted that medical applications would make lucrative contributions towards this business sphere in the ensuing years, having accounted for more than 35% toward rotary scroll air compressor industry revenue in 2016. The projected growth of this sector can be attributed to robust product demand in diagnostic tools such as mammography X-ray, blood-analyzers, and endoscopy devices. Some of pivotal constraints of rotary scroll air compressor industry are the low airflow capacity and elevating maintenance costs of the products as compared to other type of air compressors such as centrifugal, reciprocating, and screw compressors. In consequence, manufacturers have been focusing on developing new products with advanced features, in a bid to combat the existing restraints of rotary scroll air compressor market. The continent of Europe is certainly one of most remunerative regions for the growth of rotary scroll air compressor market. The region has witnessed immense product penetration across food & beverages and healthcare sectors over the years. Additionally, the large presence of chemical & pharmaceutical industries in the continent will further spur the growth of this business space in the region. It is prudent to mention that Europe has set high energy standards through the implementation of energy efficiency directives, thereby strongly impacting Europe rotary scroll air compressor industry trends. Contemporary product launches such as thermal cameras measuring air compressor temperature are also set to increase the product penetration across the food & beverages sector in the region. Rotary scroll air compressors are widely used across the medical fraternity, in diagnostic centers and dental milling equipment. This sector, in particular, has been observing a rise across the Asia Pacific, subject to the growing geriatric population base, which is expected to subsequently impel APAC rotary air compressor market share. 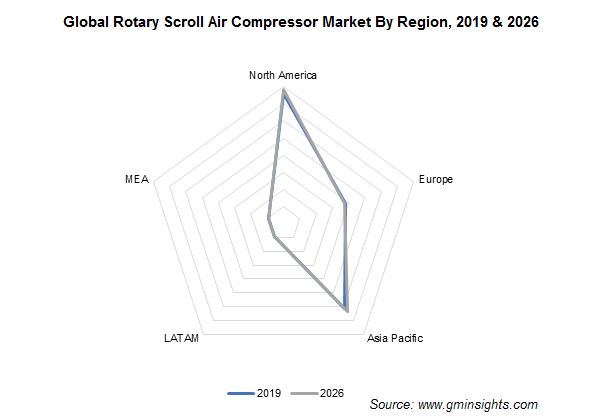 Research claims that high product deployment across countries such as China and India will further augment the growth of Asia Pacific rotary scroll air compressor industry. As per estimates, this region produced a revenue of over USD 800 million in 2016 and is set to register commendable gains over 2017-2024. With oil contamination extremely affecting the industrial processes and the working conditions, rotary scroll air compressor market firms are focusing on the manufacture of oil-free products to maintain pure air quality. Keeping abreast with major technological innovations witnessed across the globe, business players have been attempting to inculcate new features into their products to expand their product portfolio and contribute immensely toward environment safety. Energy efficiency measures taken by countries such as the U.S. and member countries of the European Union have also encouraged firms to manufacture eco-friendly products. In consequence, this is anticipated to have a lucrative impact on rotary scroll air compressor market share, slated to grow at a CAGR of more than 2.5% over 2017-2024.